DDS – Doctor of Dental Surgery degree. Decalcification – the loss of calcium from your teeth, making the teeth weaker and more susceptible to decay. Decay – tooth decay is the common term for dental caries. This condition occurs as a result of bacteria in the mouth converting food debris into acid, which then breaks down the tooth enamel, leading to cavities. The easiest foods for bacteria to convert are sugars and starches, which is why these foods contribute most heavily to tooth decay. The acids, food debris, and bacteria in the mouth combine to form plaque, a sticky substance that adheres to the teeth. If not removed, plaque hardens into tartar, which is more difficult to remove. Deglutition – the technical term for swallowing. Demineralization – the loss of minerals such as calcium from the tooth enamel. Demineralization can result from eating acidic foods or from the acids produced by oral bacteria that live on food particles in the mouth. 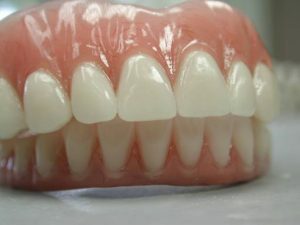 Dental Crown – a dental restoration fixed in place with cement. Dental crowns cover the entire tooth above the gum line, essentially become the new outer surface of the tooth. Dental Floss – a bundle of thin nylon filaments or a plastic (Teflon or polyethylene) ribbon used to remove food and dental plaque from the teeth. Floss is gently inserted between the teeth and scraped along the teeth sides up and down and back and forth, especially close to the gums. Dental floss may be flavored or unflavored, waxed or unwaxed. If you have questions about flossing, your dentist and hygienist will be able to provide additional information, instructions, and recommendations. Dental Resin – a dental material applied to the tooth, often in cases of severe dentinal hypersensitivity. Dental resin is not usually used unless all other treatment attempts have failed. Dental Varnish – solutions of natural resins in a suitable solvent, of which a thin coating is applied over the surfaces of the cavity preparations before a restoration is placed. Dental varnish is also used as a protective agent for the tooth against constituents of restorative materials. Dentin – the hard, yellow tissue underlying the enamel and cementum of the teeth. Dentin makes up the majority of the teeth. Dentinal Tubules – microscopic canals that run from outside of the dentin to the nerve inside the tooth. 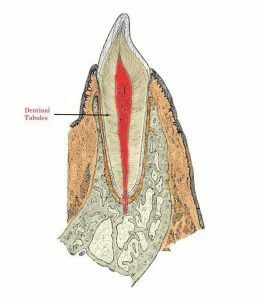 Desquamation – the peeling of gingival tissue; during this process the gingival tissues may appear smooth and shiny, with patches of bright red and gray. Diagnosis – the process of identifying the nature of a dental disorder. Diagnostic in Dentistry – a procedure performed by the dentist to identify what is happening in the mouth. Dilaceration – an abnormal tooth, where both the crown and the root are twisted. Direct Contamination – direct contact with germs or impurities. Disinfection – a cleaning process which destroys the majority of microorganisms, but not the highly resistant forms of bacterial and mycotic spores. Disinfectant – a chemical agent applied onto inanimate surfaces to destroy germs. Dislodged Tooth – also known as a “knocked out tooth,” a dislodged tooth is a tooth that has been completely pushed out of its socket. This most often is a result of an injury. Some dislodged teeth can be placed back into the socket; other times, a replacement tooth may be used to restore the appearance of your smile. Divergent – a term used when the teeth or dental implants are not parallel to each other within the arch. DMD – Doctor of Dental Medicine degree.